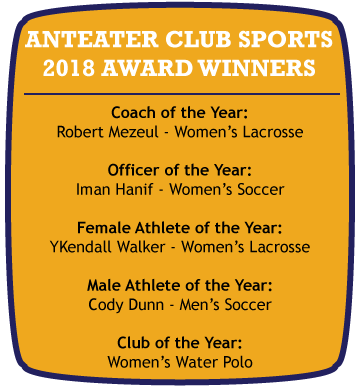 Club Sports at UCI are student-initiated and student-managed clubs that provide opportunities in recreational and competitive activities of interest to the student body. Participating in club sports provides an outlet for competing in athletics or learning new recreational activities. The Club Sports program offers a variety of sports for students to participate in and provides unique leadership and club management opportunities. The Club Sports program’s purpose is to give all UCI students the opportunity to pursue specific sport and recreation activities with others who share a similar interest.